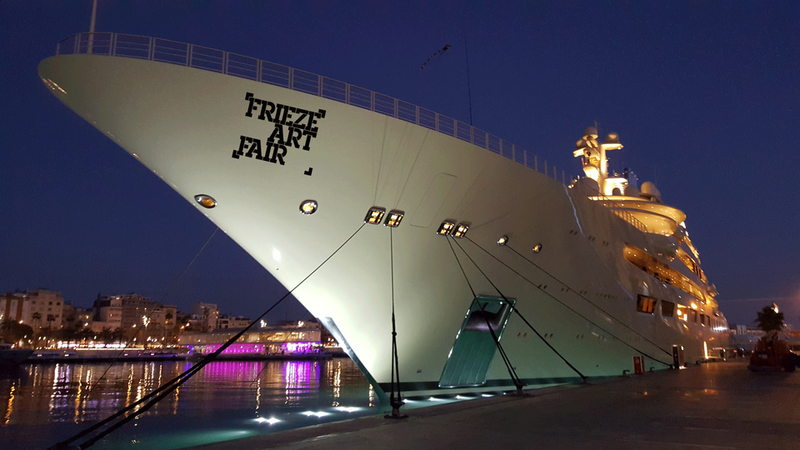 Rival fair organisers Frieze and Art Basel have announced plans to launch boutique art fairs aboard superyachts. The invitation-only events will each host around 35 galleries on so-called FFS (Floating Freeport Ships), upon which sales can be made tax-free. Both companies are currently hunting for suitable vessels, with talks underway with various collectors looking to trade in their gin palaces. Art Basel’s global director Marc Spiegler says the idea of floating fairs “chimes with an art world that increasingly operates without borders, both aesthetically and commercially.” He adds: "Art Basel has always thought outside the box of what it means to be an art fair and the idea was born from the many conversations we have had with galleries who are seeking a radical alternative to the traditional land-locked art fair. The concept allows us to be much more agile in a world where art market centres are going to shift ever more rapidly." Dates and exact locations for both events are to be confirmed but, as Brexit looms, the possibility of a Frieze Floats that sails up and down the English Channel between the UK and France has “not been ruled out” a spokesman says. For its Live programme, Frieze Floats will also host a series of evening performances and interventions during which artists will “play upon and respond to traditional notions of cruise ship entertainment, such as cabaret and bingo nights, and challenge our idea of what it means to be on a cruise in the post-colonial age” says Victoria Siddall, the director of Frieze Fairs. Visitors will be transported from the shore on a fleet of artist-designed inflatable rubber dinghies, which will be auctioned off for charity at a gala dinner on the last night of the fair. Siddall said talks were underway with artists who have “responded enthusiastically to the potential of this medium”. Interest in the project, she says, "has been swelled by the KAWs-effect" after the US artist launched Companion (2019), a 121-foot-long inflatable figure, in the Hong Kong’s Victoria Harbour last week ahead of Art Basel Hong Kong. However, fairs aboard superyachts have previously sunk without trace. After they sold Art Palm Beach, David and Lee Ann Lester launched Seafair, an art fair that took visitors and galleries on cruises from Miami. That idea bellyflopped, although Seafair, a 222 ft “uber-lux mega yacht” is still docked in Miami and hired out as an event and exhibition space.